It is Woodstock Hardware’s job to meet the ever changing needs of our customers. In order to do this, we developed a program to help you maintain your home’s water treatment and filtration system and save money in the process. 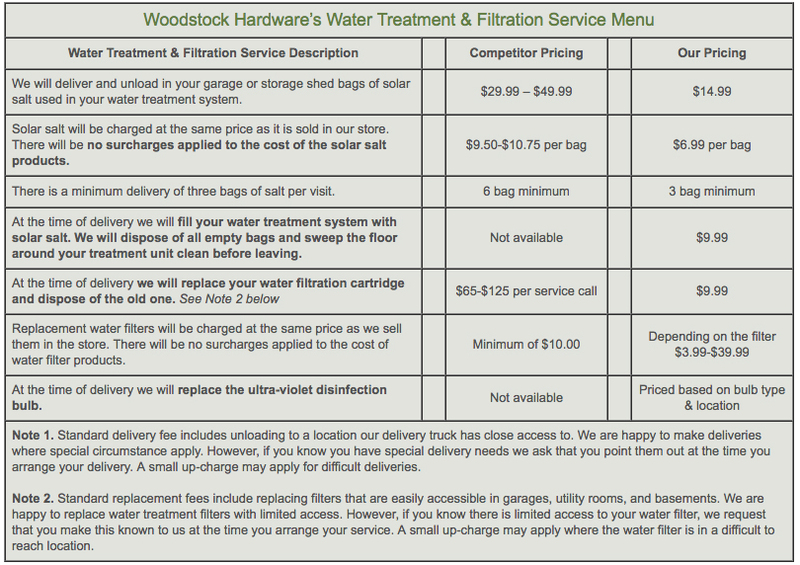 What is Woodstock Hardware’s Water Treatment & Filtration Service Program? Woodstock Hardware’s Water Treatment & Filtration System Service Program provides you, our valued customer, assistance with maintaining and caring for your home’s water treatment and filtration system. Our staff are trained to answer your questions and be specialists in helping you with your home water treatment and filtration services. This assistance can simply include delivering those heavy 40 pound bags of water conditioner salt to your home or allow us to replace your whole house sediment cartridge and your ultra-violet disinfection bulb. Woodstock Hardware’s Water Treatment & Filtration Service Program has been set up to allow you to only select and pay for those services that will make your life easier, save you time, and save you money. Our Program is set up in a simple menu format making it easy to select the services you desire. Other companies might try and sell you products you do not need, but we believe in honest customer service. Why choose Woodstock Hardware to help you maintain your home’s water treatment and filtration system? We have an extensive supply of water treatment and filtration products in our store and can easily and quickly get any specialized products we do not stock. We are able to charge less, than other companies, for the supplies required to complete this work. We have the technical expertise to complete the tasks to properly maintain your water treatment and filtration system. We have the in house expertise to set up a maintenance schedule to make sure your water treatment and filtration system is maintained properly helping you protect your family’s health. Our local proximity allows us to complete this work in a cost effective manner and cheaper than other companies can. In conjunction with Woodstock Hardware’s new Water Treatment & Filtration Service program, Woodstock Hardware is pleased to offer our new Water Treatment & Filtration Handbook. A summary of regulations and guidelines that apply to potable water systems. 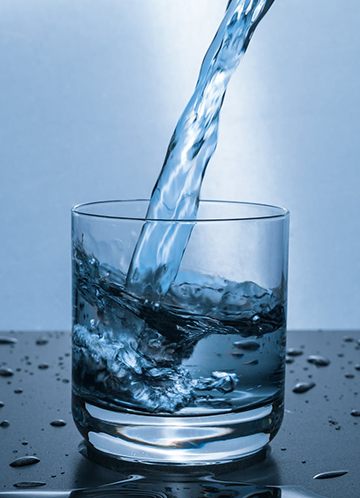 An extensive listing of common questions and answers about potable water and water treatment and filtration systems. A comprehensive glossary of terms pertaining to potable water and water treatment and filtration systems. We are happy to have made the effort to assemble all of this valuable information. We hope you find it useful in better understanding where your water comes from and the methods available to improve the quality of the water you and your family use on a daily basis. 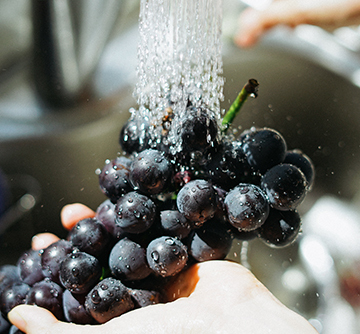 Learn about the methods available to improve the quality of the water you and your family use. To help meet the needs of our customers, Woodstock Hardware has developed a Catalog that presents a wide assortment of the water treatment and filtration products we offer in the store. There are hundreds of products and include the following product groups. Save Up To $500 a year On Your Home’s Water Treatment & Filtration System … Leave The Heavy Lifting To US! By combing through our specialized products using our technical know-how with a commitment to customer service, Woodstock Hardware is pleased to offer our solution for helping you maintain your home’s water treatment and filtration system. Trust us, it will be a lifesaver! To take advantage of our Water Treatment & Filtration Service: Sign Up Online Now! From the product categories listed above we are sure you will agree that Woodstock Hardware has the products you use to maintain your water treatment and filtration system. Act now and sign up online for this highly-reviewed service and consider yourselves firmly in the right hands for maintaining your water quality at home or on the job! This web site is owned and operated by Woodstock Hardware, an independently owned, Do-it Best, hardware store located in Woodstock, New York.